We are very much a ‘hands-on’ charity and are in touch with the children we sponsor. We receive updates from the headmasters and spend time within the communities with families, establishing relationships and connections. The Indigo Project–Gambia is currently working on four projects, if you wish to make a donation you can specify what you would like it to go toward. Alternatively any donation is much appreciated and will go towards one the listed projects. You do not need to donate to support us though, sharing of ideas is also most welcome! Please drop us an e-mail. 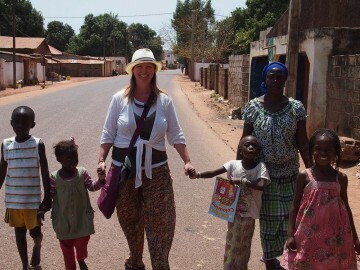 We first visited The Gambia & Sponsored 2 children to attend school. Delivered 160 kg of equipment to schools & Communities. Paid for a teenager to access hairdressing school then she could support herself through law school. Delivered a mountain bike to a 13 year old to help with his journey to school. Paid for Malaria treatment for a 5 year old girl admitted into hospital. Delivered a mountain bike to a teenager to help with a school journey. Delivered 100 kg of equipment to schools and communities. Delivered an engine & 150 kg of clothing in a container to set up a shop. Paid for concrete flooring to be laid in a skill centre. Equipt a tailoring & skill centre in a rural community. Delivered football scarves kindly donated by Elgin Football club. Paid for treatment for a young girl with bad tooth abscess. Delivered school equipment to pupils. April a group of 10 went to The Gambia and painted the nursery walls. Donated £1000 towards the Upper school build..
Raise funds for the school build. Supply school packs for a further 30 children in the rural village. Build a water tower supply the children with access to daily water. Build a bike rack at The Janet School. Raise funds for the next build. These are handed to children in the communities we visit, they cost about £2 to make up and provide the children with much needed essentials.